FROM SOUTH: The main route is I-85 north, towards Atlanta. Go 32 miles and exit at Tuskegee/Franklin exit, number 32. Turn left on AL-49 north. Look for sign with Reeltown and Dadeville information. When you reach Blue Creek (approximately 24 miles from I-85), Tallapoosa County Road 34 will be 2 miles on the left. Turn left onto CR-34 to campground. Good landmarks on I-85 and AL-49 are the Stillwaters Resort signs. ---- FROM NORTH: From US-280, exit onto AL-49. Go 5 miles to CR-34. Go about 2.5 miles and watch for sign to Recreation Area on the right. Active, National Guard, Reservists, Retired, 100% DAV, DoD Civilians at Maxwell AFB. April 1st - September 30th. Closed during the winter. Accepted. 6 months in advance for active duty, 4 months in advance for all others. Must cancel within 7 days for full refund, otherwise a $15 cancellation fee. Pets allowed in campers/rvs only with usual leash and clean-up rules. Not allowed in tent area, chalet, or rental trailers. 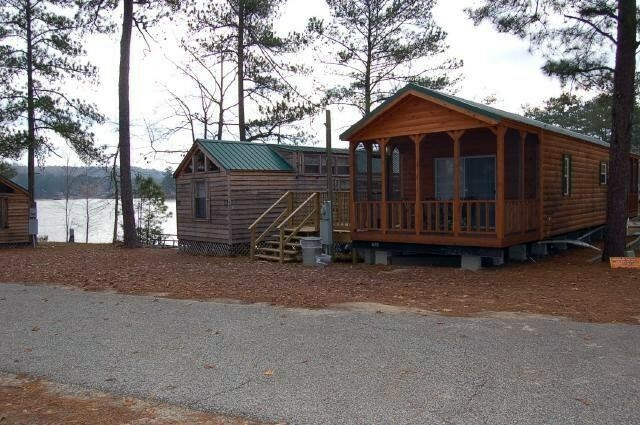 9 day stay limit in cabins. 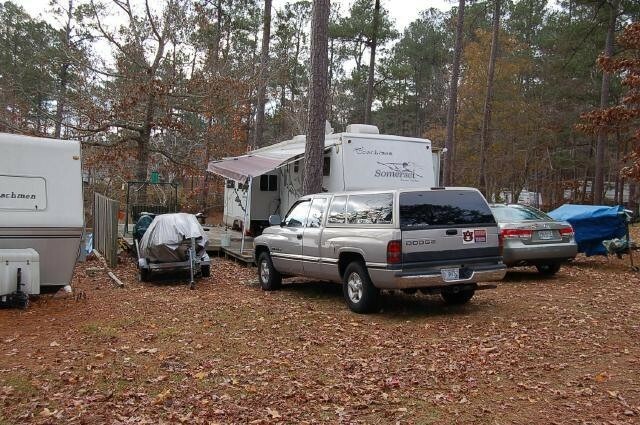 Cabin/Mobile home guests must bring their own linens; prices based on rank and type of accommodation. Caution must be used with big rigs. Firearms are to be kept in RV. Arrived expecting a typical well maintained military facility but was disappointed with the parks overall appearance and maintenance. The staff was helpful and appeared to be doing their best. Trash cans were full to overflowing, grass in need of mowing, bath houses in need of cleaning and maintenance. 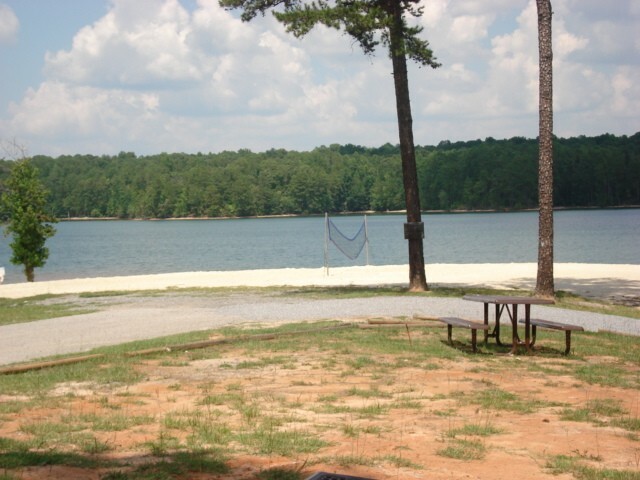 It is truly a shame that such a well located camp with such a beautiful lake cannot be staffed in such a way as to maintain this place as a premier park. Having a camp host and soliciting some volunteer labor in exchange for a campsite might go a long way in the betterment of this park. The lake was beautiful. The campsite was a dump. 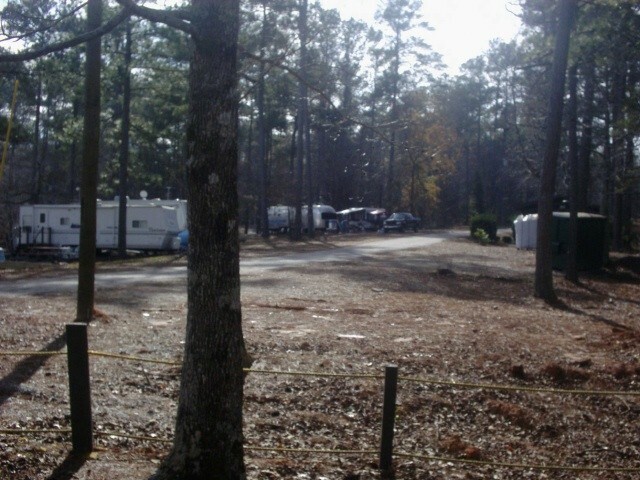 The RV sites were narrow and difficult to park in due to sites being overgrown. Trash cans were over flowing with trash. Bath houses were gross. Ladies’ side had no electricity. Dump site was a small square concrete covered with sticks. The hose at the dumpsite had been there so long you couldn’t twist to remove. The other dumpsite had a hose but no running water. Now, the septic was obviously full as it took a LOT of time for the waste to slowly bubble down. We had to hook up to vacant full hook up site to finish the dumping process. I was VERY disappointed with this AF property! Rumor has it that fisherman had been homesteading unbothered for years....it shows. Needs help! I would give 0 stars for campsite, 5 for Hod’s beautiful lake. The location is excellent. The staff is courteous and doing the best with what they have, however they don't appear to have much. This place could be so much better but it really needs to be remodeled and rejuvenated. Everything is outdated or in disrepair. Even though we paid through Maxwell MWR, we were never asked for any military ID as confirmation. The trailer we rented had a huge water leak with water coming up under the flooring in the hallways. Please 42nd FSS / MWR come and rescue this place. If nothing else, send some of those students from Maxwell / Gunter AFB to do their graduating class projects over here. Provide them with tools, supplies, food and beverages for some free labor in return. 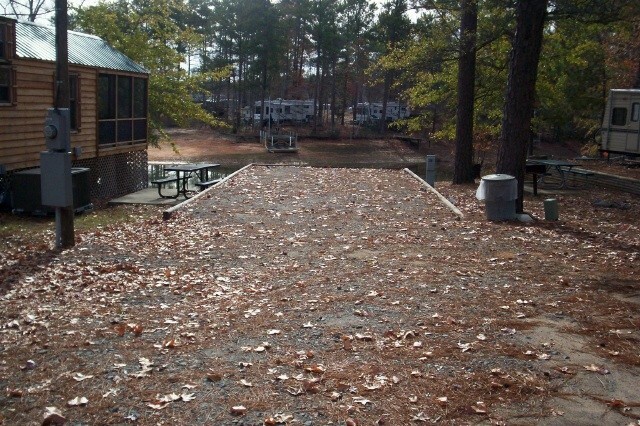 This by far is the worst campground that we have visited. The smell of dead animal from the dumpster near our camper made it almost impossible to sit outside and enjoy the scenery. The grass was uncut and bath house looked like it hadn’t been updating in probably 20 years. The bath house was in disrepair and filthy. Only one toilet worked. The lots were elevated, narrow and unlevel. The location was awesome, but it is hard to believe that this is a military facility. I would not recommend this campground. This is one of the best kept secret's, this is great for the outdoorsman. 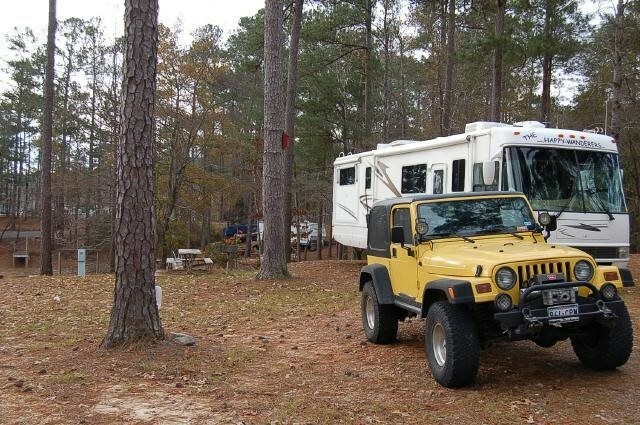 RV sites are good. Would return this time of year, and stay for Two weeks the next time. I agree with the last review 100% and this place is in dire need of a good cleaning inside and out. It was almost deserted and unless you want to fish only there's nothing to do. The beach is covered in feces. We had a good time on the lake and was in a good location but probably would not go back. 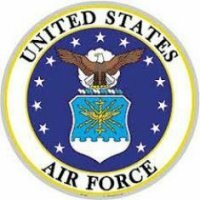 I am surprised the Air Force doesn't inspect their facilities and more surprised they say it is a military facility but do not even help with funding. I know a tornado messed up a lot of trees but that has nothing to do with cleanliness. On a good note the staff was nice and we had a great time on the pontoon boat we rented. 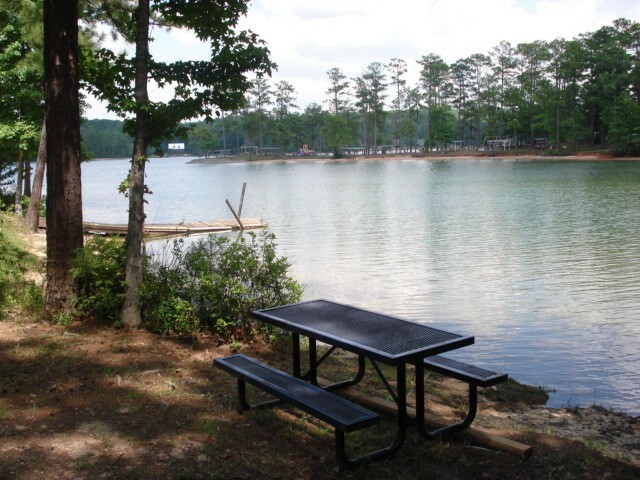 First the positives - The campground sits on Lake Martin just outside of Dadeville, AL. The view to the lake was beautiful. There are several shaded sites which is nice. Unfortunately the CG is not well maintained. The manager (??) told me they have a had difficult time for the past 3 years and are barely making it. He said he was short of help and didn't know if they could survive another year. I realize that all rec facilities must be able to survive on their own. He hinted that this CG downfall started when MWR stopped funding and when the "full timers" were made to move out. I checked out the bathhouse and decided I would not use it. Again poorly maintained and not very clean. The site we were assigned to as well as 3 or 4 next to us were gravel and narrow. It was impossible for us to completely level our TT. The sides of the parking area had a severe slope of 2-3 feet. In order to walk down to the lake edge you had to carefully maneuver down that slope. They did have some broken cinder blocks in the gravel as "steps" but it did not help much. Dangerous. I slipped a couple of time. We were to stay 3 nights but left after 2 nights. Didn't feel comfortable on this narrow gravel parking pad (only big enough for our TT), the fact that we couldn't really get level and were at the lake edge. Didn't want our trailer rolling into the lake. To top it off the fish weren't biting. We stayed here in a 30' TT. Sad, it could be a very nice campground. We probably won't stay here again. Enjoyed the two day stay. 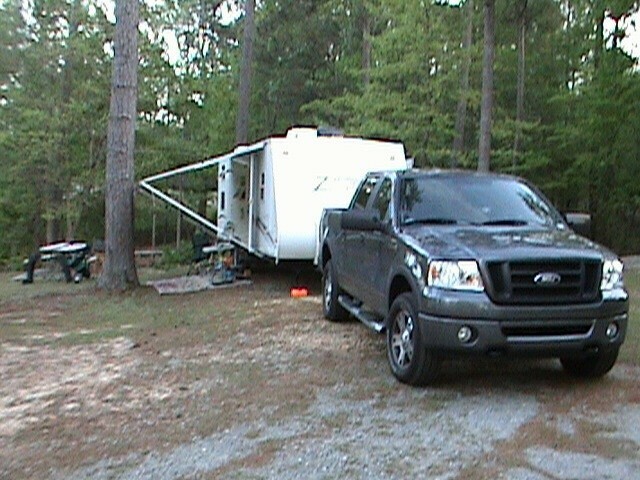 The area we stayed in says it is big rig friendly, we have a 35ft fifth wheel and believe me it was tight. Got in and parked sites we were in had great view of the lake and were wooded. Many of the sites in the park need maintenance due to past storms. Staff are helpful and knowledgeable of the area. 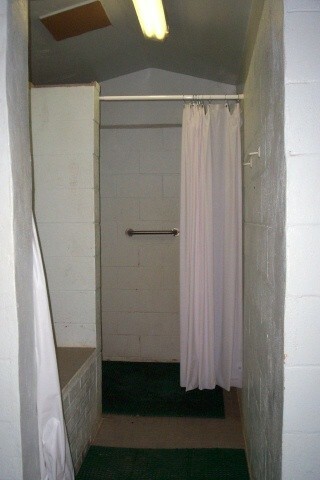 The bathhouse we used was old but clean. Laundry was a single washer and dryer but worked well. Nice visit, but could use some work on sites. Well, finally all the whiners about us old timers have won. The park closed on Sep 30 and all of us old timers have had to move. The park is scheduled to open again on Apr 1 and be open until Sep 30. 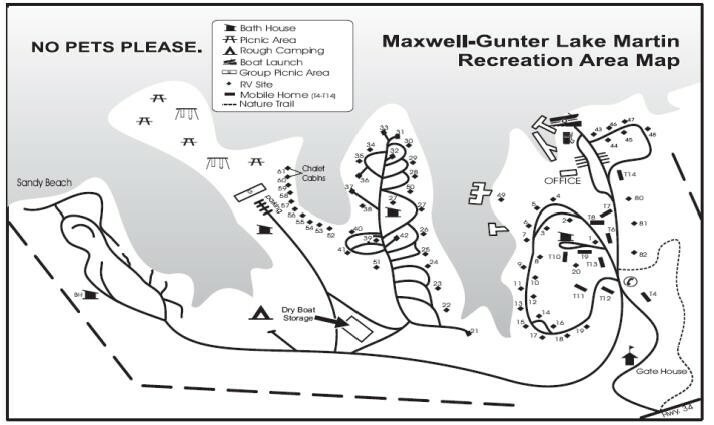 It is everyone's opinion that after the closing on Sep 30, 2013, that will be the end of Maxwell/Gunter Rec Area. I had a place at the park for 15 years and never had a problem with day campers. I did have several day campers talk about us permanent campers and I was quick to tell them that us permanent campers paid the bills after Sep 1 thru Mar 31 when no one was ever seen. Fishermen would want to be at the park for a week or two when the Crappie were biting. Other than that you never saw them until the following year. We did have a couple of cranky old retired guys but if you were intimidated by a cranky old retired guy then maybe you should choose another profession. There were and have always been available sites for people that wanted to become long time campers. 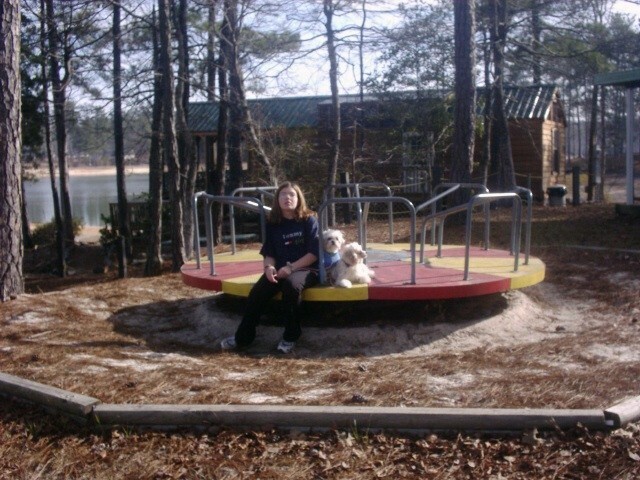 When the park closed there were at least 10 to 15 nice water front sites available for renting. Not all people will ever be pleased. My wife and I took a 5,000 mile trip in our motor home this past spring. We stayed in some of the most beautiful parks out West. There was always someone grumbling about something. While Maxwell/Gunter did not have all the luxuries of a motor home resort, it was one of the most beautiful places I have ever been too. It was my sanctuary for 15 years. It is my hope that it will remain open but I seriously doubt it. 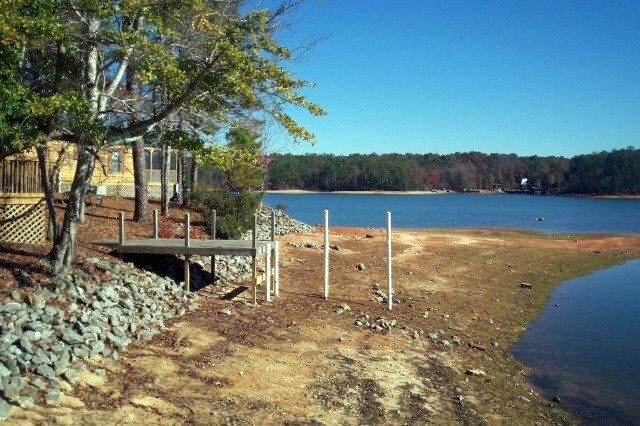 I just hope that in the summer of 2014 when it does not open that some of you that did the most complaining bring your family and you remember how beautiful the Lake was and I hope you are sorry that you complained enough to shut this place down. Shame on You !!!!!!!!!! My family and I have rented a RV site for the last 4 years. We have been visiting this area for over 12 years when we have been stationed nearby. We absolutely love this place. It is a great vacation get away. It provides wonderful opportunities to have quality family time. We also have had several work gatherings here as well. Our military friends and co-workers are always in aw by the beauty of the lake. Several of our friends (active duty) have joined us and hold permanent places. So don’t be scared away from the previous postings about the cranky retired folks. 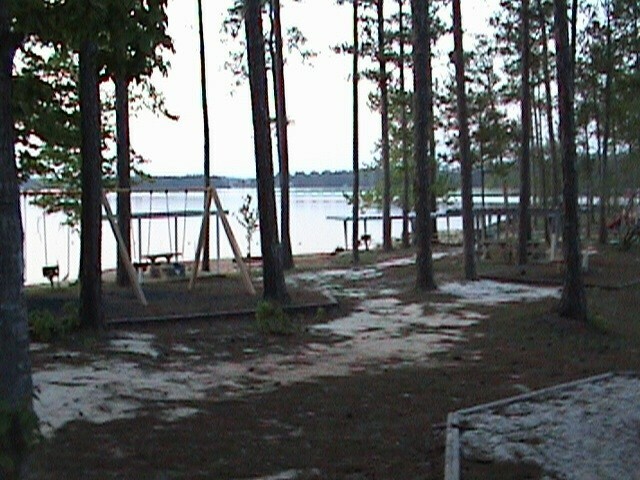 :) Lake Martin is one of the most beautiful places I have ever been, and we have been stationed from New York to Alaska. Yes, I agree it isn’t the most lavish of all facilities and a little work is needed here or there, but the people who work there are very kind and always helpful. If you are looking for a relaxing, slow paced vacation this is the place to stay. The Maxwell/Gunter Rec. Area is back in operation. It sustained a lot of damage from the tornado, but the staff is working to get everything back in order. This Rec Area is a joke. If they didn't have a sign that says it's military, this old soldier would have thought I found the last old fashioned fish camp for homesteaders and other old timers. They claim 66 site but in reality they have 5 if you happen to go for a few days. The rest are full of "longtimers", read homesteaders. The 5 sites they do have are rough, uneven and way overpriced at $20 a day for w/s/e ,no cable, no local over the air TV. It is scenic with the lake being very nice. I would not recommend this place unless you are looking for a place to hunker down for the rest of your days. Hard to believe its an Air Force facility. The only thing they did well was refund my 4 day fee when I left. 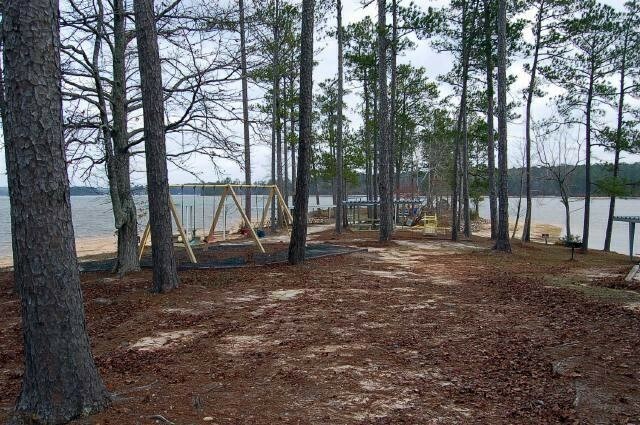 The ratings for this location are definitely for the cabins, trailers and marina. The lake is beautiful. Of the 76 sites advertised I only found 5 that were for the RV traveler and could not get conformation from any of the staff. 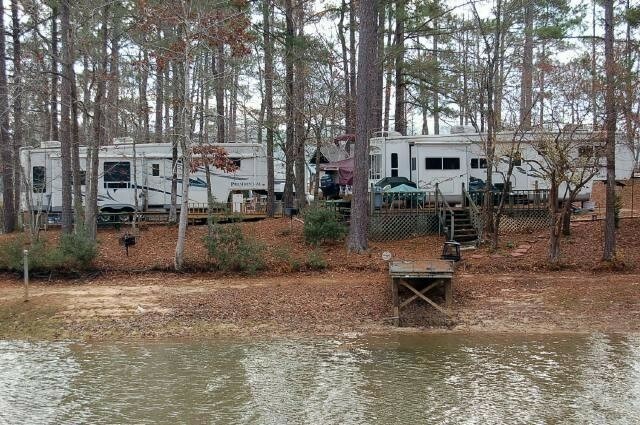 The rest are permanently occupied by RV’s that stay there year round. They have decks and additions built on. 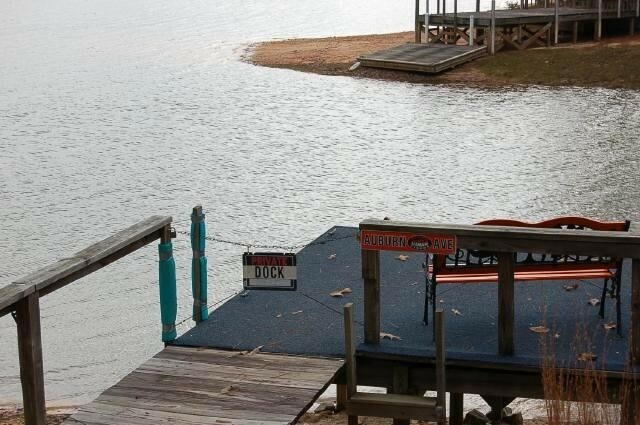 Some even have private docks. They seemed to be used by the owners and their families for weekend getaways and vacations. We were to stay for two weeks but left after 3 nights. My wife went and checked in at the Marina and they gave her directions to our site. That was the last we saw anyone from the staff. We had site 52 which has full hook ups. The site is rock (not gravel) and just wide enough for the width of your axle. The sides then sloop down from there. It took 6 inches of leveling blocks on the right side to get it level. While standing on the ground at 5’9” tall I was on my tip toes to open the door. My wife had to balance on the step to get the door open. The area around the site is dirt with some weeds. The picnic table is on a cement slab. Site 53 had 4” of leveling blocks. Site 54 was not occupied but appeared to be a little more level but you have to back between 2 large trees, you may have a couple of feet on each side. 55 and 56 are permanent. 56 looks like nobody has been their in several years, dirty with pine needles and leaves. 57 is next one of the cabins and is level. It is built up with a retaining wall so with your rig to one side once you come off your steps you may have a step or two before you go over a 3’ foot retaining wall. The only other site I saw was by the beach and it appeared to be ok. We got 3 channels which were all PBS. I could not get any satellite reception from my site because of the trees. The town is 8 miles away. Wall Mart is 23 miles. If you have question that can not be answered by the reservation desk at Maxwell AFB they will tell you to call the campground. You may or may not get a call back. I didn’t. You would think that a campground that has the year round occupancy that this one has, the few sites they have for the rest of us who are Serving or who Have Served would be in the best conditions. 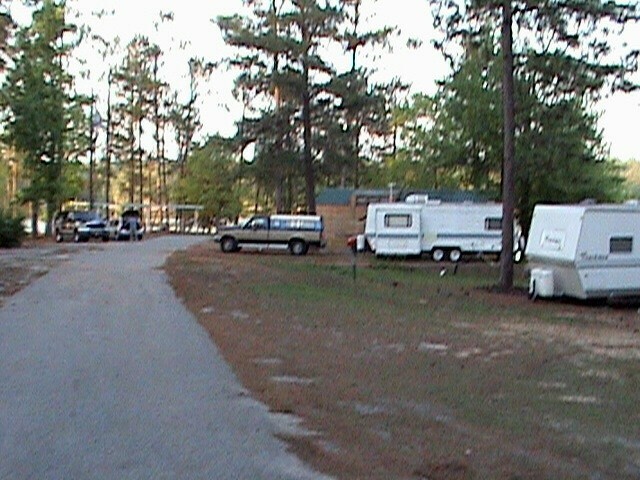 This is not a Military campground it is a private trailer park on OUR LAND. 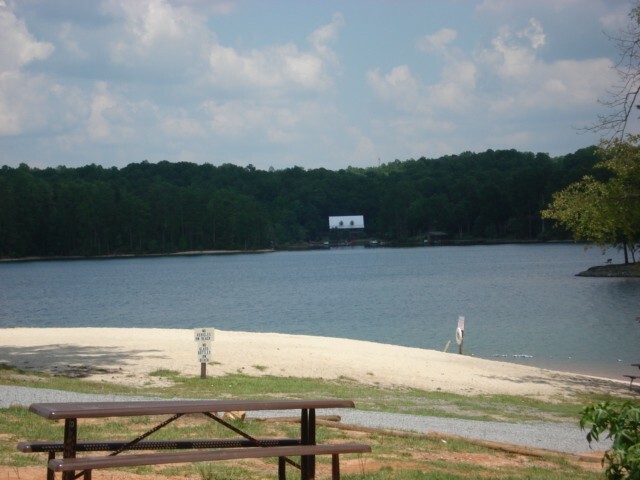 Great place for peace and quiet and to enjoy the lake. Did get a chance for walks and to sit by the lake, feed the very tame ducks who came to visit everyday and watch the sun go down. Asked about the 'full timers' they were there before the policy for max stays was in effect, as the manager said they help pay the bills for the slow times. 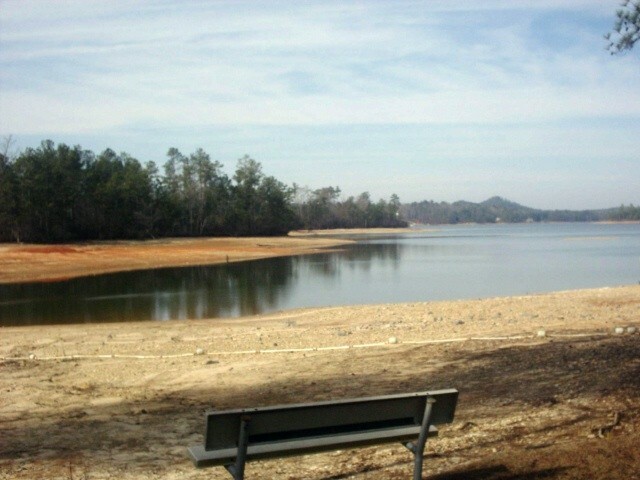 One thing to mention that the town of Dadeville is approx 6 mls from the lake, at the closest Walmart it 14 mls. So you may want to stock up for the stay. Will be sure to come back given the chance. My husband and I and our twin daughters just returned from a weekend staying in Chalet 3. We had a wonderful time and the facilities are awesome!! One of the staff named Amanda was so very friendly and so welcoming! We plan on bringing the whole family back in August and are counting the days! Brenda S.
We just arrived home after spending New Years Eve and Day at Chalet 1. It was the perfect place to bring in the new year!! It is an oasis of peace and quiet and with no distractions it was so very restful! We plan on making another reservation to bring my sister down for her birthday and we cannot wait until we are back!! Doug was so very friendly as was a young man with the name of Lindsay. We are so blessed to be able to stay at such a wonderful facility!! We stopped by for only a one night stay. Although it is the "slow" season, we didn't see many sites open for camping. Actually, it seemed that 90% of the sites are occupied by long-term residents. Although, hardly anyone was around. It appears they keep their RV there and only visit occasionally. While I understand the financial benefit to the campground for long-term residents, many other military campgrounds have found a good compromise. I'm not sure that compromise is here. 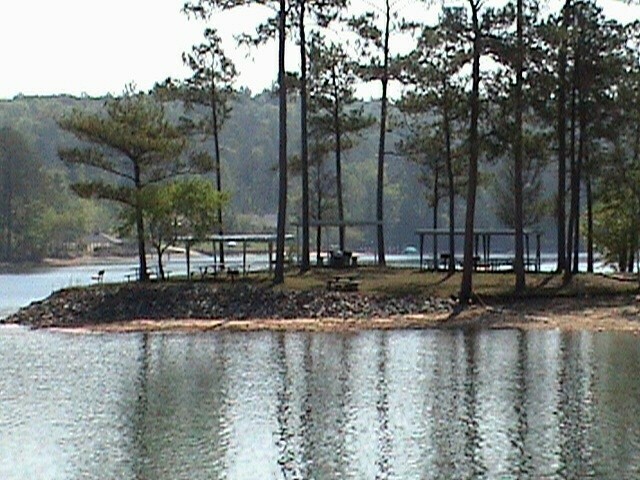 MANY of the long-term residents have built docks on the lake at their site, but has marked them as "Private Use Only". What? A military campground allowing PRIVATE modifications and restricting use to them!?!? One long-term resident has even built a building connected to their trailer. "Homesteading" has gone overboard here! 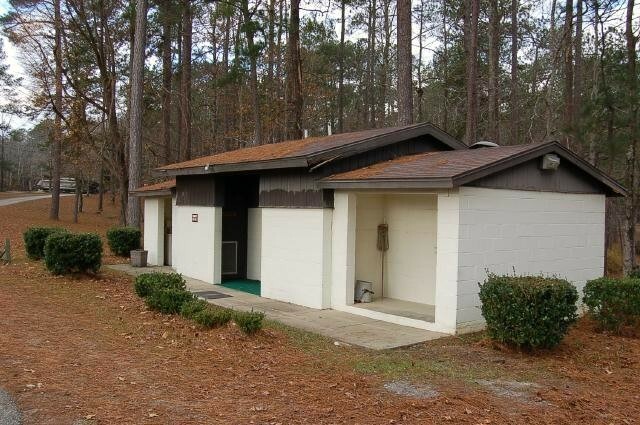 It no longer seems like a military RECREATION facility, rather a military HOUSING area. But it's not all bad - this is a good, quiet location on the lake. It appears there's plenty of activities for the family during the prime season. Doug, the office staff was friendly and helpful. The couple that run the camp are wonderful folks! The site was gorgeous - right on the water with nothing but peace and calm!! There are several LONG term campers who have a little ATTITUDE!! Retirees should not forget who owns the property we are VISITING! Even if we are paying... Camp was very clean - employees were all friendly - roads in good shape -- just a wonderful experience except for the long term folks attitude's.. Would go back in a heart beat!! My husband & I absolutely love this place. We stayed in Chalet 1 the first time and loved it so much we brought my mom & step-father back to Chalet 3 for her birthday. The staff to include Johnny Davis, Doug and Penny Hooks are incredibly nice and so helpful and caring! We are already making plans to return again soon. Maxwell Gunter is so blessed to have such a special facility and such wonderful staff!